Emma Guthrie expects this summer to be like any other in the South Carolina Lowcountry–hot and steamy with plenty of beach time alongside her best friend and secret crush, Cooper Beaumont, and Emma’s ever-present twin brother, Jack. But then a mysterious eighteenth-century message in a bottle surfaces, revealing a hidden pirate bounty. Lured by the adventure, the trio discovers the treasure and unwittingly unleashes an ancient Gullah curse that attacks Jack with the wicked flesh-eating Creep and promises to steal Cooper’s soul on his approaching sixteenth birthday.When a strange girl appears, bent on revenge; demon dogs become a threat; and Jack turns into a walking skeleton; Emma has no choice but to learn hoodoo magic to undo the hex, all before summer—and her friends–are lost forever. Emma, Jack and Cooper are spending their summer in the South Carolinas. She has big plans for the summer. After half a year away at a boarding school with her brother Jack, Emma is finally back with Cooper (her secret crush). But things don’t work out exactly as she plans. The three discover a message in the bottle that leads them on a treasure hunt. But this is no fairy tale adventure. Soon, Jack is cursed with the Creep, a flesh eating curse and Emma must do everything in her power to save her brother and the boy she loves. So the characters, let’s talk about the characters. Emma was a interesting enough character. I like how she constantly tried to do something in order to help her brother and Cooper. She had a lot to deal with, and while discouraged, she still tried to push through that. I have to give her serious props for that. Jack pretty much annoyed me the whole book. Instead of being the older brother, he seemed like a little kid and I, personally, didn’t care about him being plagued by the Creep. I know, that sounds awful, but seriously, this guy needed to grow up a little. I think out of all the characters, I like Cooper the best. I just felt like there was more to his character than the others. He actually seemed like a typical teenage boy. His interactions with Emma were sweet, and his friendship with Jack was what kept me rooting for Jack to survive. Overall, this is an interesting premise. The whole hoodoo is not something I’ve ever read before and I enjoyed finding out more about the culture. The world Lea created was believable and a little scary, which I give huge thumbs up for. The book was a quick read for me, but it read a little more like a middle grade story. I don’t know if it was just me, but it didn’t read quite like young adult. However, I am interested to see what happens next with the characters and where Lea takes this new world. If you like a little bit of adventure, magic, and romance, this book is the one for you! 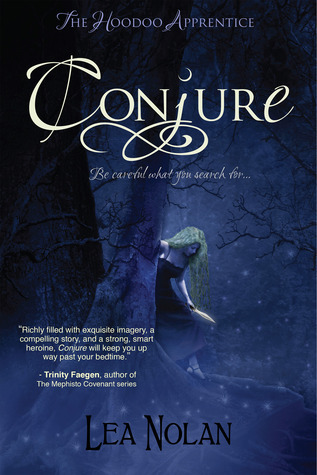 Conjure comes out October 16th, 2012. P.S. Thank you Entangled Publishing for the ARC!!! When I first saw the blurb blitz for this I was instantly interested. For me, it was reminiscent of The Goonies and Pirates of the Caribbean. Since you've mentioned middle grade, I think I'll take a pass.